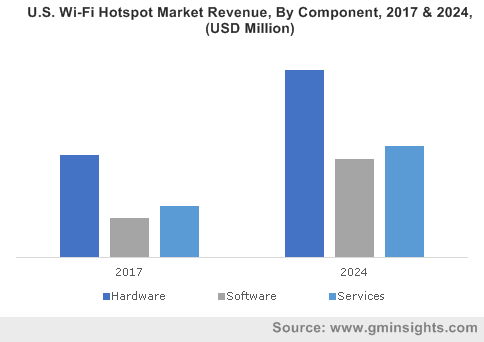 Wi-Fi Hotspot Market size was estimated to be over USD 10 billion with the installed base of approximately 300 million units in 2017 and is anticipated to grow at a CAGR of more than 12% over the forecast timespan. The Wi-Fi hotspot market is driven by the increasing penetration of smart devices across several countries. The adoption rate of smart devices is ten times than the adoption rate of personal computers in the 1980s, three times faster than the adoption of social media and two times faster than the adoption of the internet in 1990s. The total number of smartphone users across the globe has crossed 2 billion, up from 640 million users in 2012 and the number is further anticipated to increase in the future. The growing adoption is attributed to the increasing trend of social media and growing internet penetration. The availability of low-cost smartphones in the developing countries such as India and China are also fostering the adoption of smartphones. The growing adoption of BYOD policies and enterprise mobility among organizations are also driving the adoption of Wi-Fi hotspots among organizations. The organizations are rapidly moving toward BYOD policies to increase employee satisfaction, efficiency, and performance. It also helps in reducing upfront expenses associated with the establishment of digital infrastructure facilities with their employees. Allowing employees to use their own personal assets makes them more responsive and amenable to work for longer durations. In addition, it also enables companies to bridge the gap between desk-bound employees & their non-desk counterparts. The security issues associated with the use of Wi-Fi hotspots are hindering their adoption. The lack of authentication requirements in public Wi-Fi hotspots makes them more vulnerable to cyber-attacks and the risk of hacking. Hackers can easily gain access to the network and misuse sensitive information. Moreover, hackers can also use Wi-Fi hotspots to distribute malware. Hence, consumers and enterprises are reluctant about adopting Wi-Fi Hotspot solutions. The hardware market accounted for over 55% of the market revenue in 2017. The market growth is attributed to the high adoption of Wi-Fi gateways among the residential and the business segment. It is used to provide authentication, authorization, and accounting for a wired or wireless network. The adoption of internet-enabled devices and the increased IP traffic are driving the deployment of gateway devices in the market. Moreover, the adoption of cloud access points among enterprises also promotes the market. 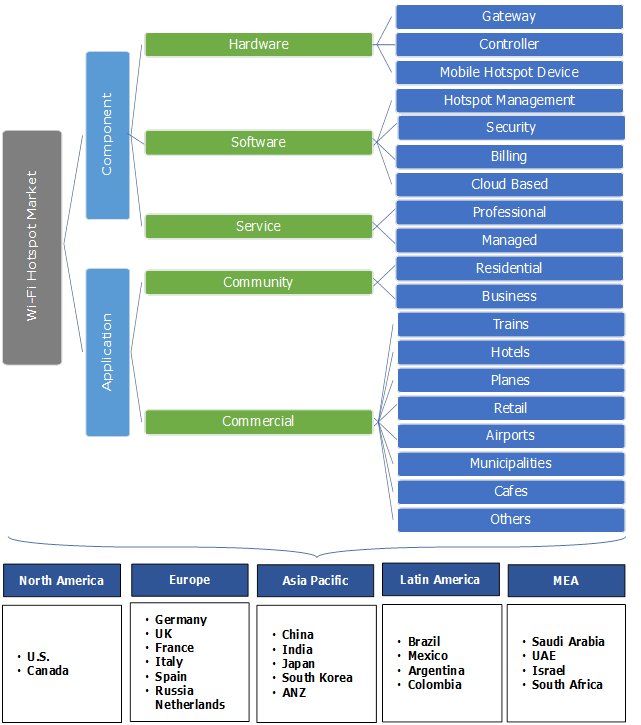 The software market is estimated to grow at a CAGR of over 15% during the projected timeline. 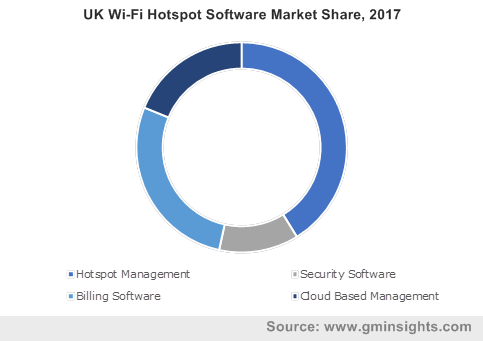 The market is driven by the growing adoption of customized software solutions among users to manage their access to the Wi-Fi hotspot. These software applications are used to grant registered and unregistered access to the network and ensure the security of the network by encrypting the network data traffic. The software systems are also used by the organization to monitor the data consumption per user and generate bills for registered users. The services market is also anticipated to attain a steady annual growth rate of more than 13% during the forecast timespan. The demand for the third-party service providers among organizations is the primary factor that will augment the market. The companies are outsourcing their IT infrastructure management services to minimize the operational costs associated with the maintenance of IT infrastructure. Moreover, the rising need among organizations to focus on core business competencies and enhance the business performance also encourages the adoption of managed service providers. The commercial applications accounted for more than 15% of the total stake in the Wi-Fi Hotspot market in 2017. The increasing internet penetration and the growing adoption of smartphones and tablets across several countries are the primary factors accelerating the adoption of Wi-Fi hotspots at public places. The retail sector leads the commercial application market with a share of more than 40%. The retailers are leveraging on the Wi-Fi hotspots as marketing tools to enhance the customer experience and gain insights about the customer behavior. Furthermore, retailers are also offering free Wi-Fi services to engage with the customers and retain them to gain an edge over competitors. Community applications are projected to grow at the CAGR of over 12% during the forecast timeline. The integration of Wi-Fi-enabled devices with home automation and smart home solutions is the major force accelerating the adoption among residential users. The unlimited data offered by internet service providers and telecom companies at the discounted price is also encouraging the adoption of Wi-Fi hotspots at homes. Europe is dominating the Wi-Fi Hotspot market with over 35% of the total market share. The high adoption of Wi-Fi hotspots in public places is supporting the market growth. The presence of a well-developed network infrastructure and 4G network also promotes the adoption in this region. Moreover, supportive government initiatives in the region for the development of connected public infrastructure also act as major drivers in the region. For instance, in 2016, the UK government launched the GovWifi initiative to replace the existing network in government offices with a single secure Wi-Fi Hotspot network. 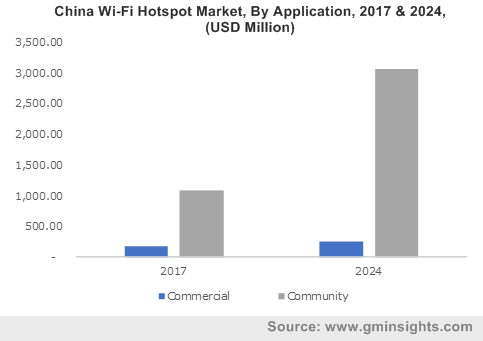 Asia Pacific Wi-Fi hotspot market is anticipated to attain an annual growth rate of more than 15% during the projected timeline due to the widespread adoption of smartphones devices and a large number of internet users. Digitalization initiatives undertaken by the government of developing countries also augment the demand for Wi-Fi hotspots in the region. For instance, the Indian government along with Google is planning to deploy more than 400 Wi-Fi hotspots at railway stations across the country. The strong growth potential of the Wi-Fi hotspot market has attracted new players to the market. The key players in the Wi-Fi hotspot market are Ipass, Nokia Networks, Alcatel-Lucent, Aptilo Networks, Motorola Solutions, Netgear, Ericsson, Boingo Wireless, Cisco Systems, Ruckus Wireless, Aruba Networks, and Ubiquiti Networks. The players are mainly leveraging on acquisition and merger strategies to gain the market share. For instance, in 2018, Nokia Networks acquired Unium, a Wi-Fi start-up to access its mesh Wi-Fi technology for home networking services. Similarly, in 2018, Boingo Networks, a Wi-Fi service provider signed a definitive agreement to acquire Elauwit Networks, LLC for USD 28 million. Boingo Networks expects that this will expand its addressable market by an additional 16 million customers to their customer base in the U.S. In the past decade, there has been an unprecedented growth in the number of wireless users, applications, and network access technologies. Today, extensively traveling laptop users access the Internet at a variety of places & environments including their homes, corporate offices, and even public places such as airports, conference venues, shopping malls, hotels, libraries, and arenas, among others. Contemporary Wi-Fi wireless LANs, based on IEEE 802.11b technology, provide a relatively high data connectivity at 11 Mb/s at such places, and this data rate is expected to grow exponentially over the projected time frame. The growing adoption of smartphones and the increasing consumption of rich media content are major factors driving the adoption of the Wi-Fi technology and increasing the market share. In recent years, Wireless Internet Service Providers (WISPs) have established Wi-Fi hotspots in increasing numbers at public venues, providing local coverage to traveling users and empowering them with the ability to access e-mails, the web, and other Internet applications.